I feel like its been forever since I've last submitted a picture for some C+C. Anyway, this was formerly my secret santa gift to someone. But this has evolved into a huge learning experience for me so I'd rather make the most of it, and use what I've learned for my current/new secret santa project. I've made a lot of changes thanks to Arachne who was kinda enough to allow me to PM him/her. Anyway, my biggest issue is with the fabric for her skirt, i'm having a real hard time getting things to turn out my way, and I can't seem to find a reference that uses this size or has that amount of fabric. But any C+C would be greatly appreciated. Re: [WIP][C+C] I don't even. Sorry no time for a real crit. But I would say Google for the word Sarong. It's a piece of clothing that is typically similar to what you are trying to draw. I'm usually not good with clothing names, but my girlfriend wears these. Sarongs are just a big piece of cloth that you can tie in a few different ways to have it stay on your body. I really need to do some clothing studies as well. You know I was googling toga, and roman attire trying to find good references, lol. Sarong is a lot closer to what I am going for here. Thanks! And I forgot to mention that I do have plans to move the cloth up the hips more, it is the way it is now after some pelvis lengthening and other various moving anatomy that had occurred. Seems odd that both shoulders are raised. Normally the left shoulder drops as the right arm is raised over the head. Then u want to do the opposite with the hips (raise the hand on hip and drop otherside), the degree to which u exaggerate says something about her character. That would therefore put weight on the hip with hand on it and allow the other leg to extend freely away from body or knee bent on tippy toe if she's posing for attention. 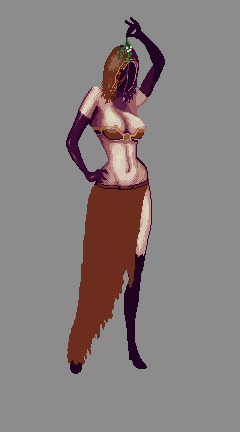 I'd rather lower her shoulder than mess with her hip placement...As i'd have to change the legs. I like how the weight is placed on the leg that is stick out from the cloth, I think it helps to bring attention to her bare bits. This looks more natural and relaxed, but I hate that I lose the exaggeration in the pose, that raised shoulder really gives it attitude. Though that might also help a bit with the straight back problem. without giving much critique to the structural part, the actual foundation of the figure drawing - the pose - is weak. If you act yourself in you will recognize that most people tend to stabilize them (hand on hip) on the standing leg, as long as there is a leg which don't carries a lot of weight. In terms of exaggerating static standing poses it can add a lot of live if you change the weighting from a 50/50 approach of the legs to something like 30/70. THis further leads to a stronger stretch and pinch in the torso area and to a contraposting of hipline and shoulder line. 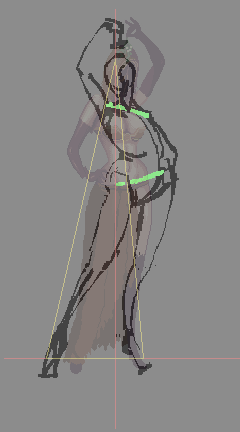 While the figure is still pretty solid in terms of weighting the stronger overall S-curve of the whole body adds a lot more live and tension to the figure. Compare my rough pose with your underlying much stiffer figure. Another aspect which is pretty weak in the overall pose is the raised arm, I don't know what's the point of holding the mistletoe(?) up in the air. While the arm in the air would make sense if it's a dancer, the position of the hand don't really follows the overall flow of the pose, neither in your drawing nor in my edit. I would most probably go with another approach for that. I never even thought of alternating arms! Anyway, the mistletoe over the head comes from an old English Holiday tradition. If you walk under a mistletoe during the holidays you are supposed to kiss your significant other. On a side note, I posted this same critique over at PixelJoint yesterday, still haven't gotten a reply. But within a hour of posting here I get one...Crazy. That tradition is clear to me. However that the figure holds it up for that purpose seems weird to me. Wouldn't it make more sense if you'd add it to some backdrop structure and let the char do something else? Hmm...Might be an American sitcom/culture thing? I dunno, to me it doesn't seem weird because I've seen it used in this fashion so much. Anyone else have any ideas? -Now I have played DS2 recently, but I can't for the life of me tell what's going on with that face - you didn't say anything about the face in your post, is it finished or not? I think their faces are wrapped in something but I can't really see that here. -I think we all struggle with fabric. Just as in sketches I'd imagine where the leg is, and start with simple interactions between its form and the cloth laying over/hanging in front of it. Lachrymose's post demonstrated this pretty well, but I'd think those lines should be very light in most cases, with a dithering to taper them back out into the smoother surface. You can then closely analyze them in game, or if you could get a reference shot, just practice the folds from various poses. I've seen these lines branch off a lot or even go back on themselves. Other than that I love your colours and use of dithering! In fact I'll probably end up referencing this a lot for my own purposes.